Can our eyes see this much ppi? mir, 13 May 2015The iphone 6 plus will eat this for breakfast...Riiiiight. On yeah..... You're just trying to bait. IPhone never has and never will be anywhere close to the top. Plain and simple. T-Ill, 30 Apr 2015This will be the best phone of 2015 even when the note 5 lands..Nothing can beat what LG has c... moreLOL! Anonymous, 02 May 2015jealousy ?Meanwhile you and others are here misleading based on your own subjective and not accurate opinion. AnonD-105341, 03 May 2015the best camera (full manual mode future with spectrum sensor that deliver true color and new ... moreWell you got at least a couple things right. Anonymous, 03 May 2015you are wrong i tested the g4 camera last night and i compared to my galaxy s6 edge and believ... moreThe G4's camera is only better than the S6's in night shots. In daytime they have about the same detail, but the S6 has much better dynamic range and exposure. The S6 takes better video period. As well as audio recording. And it pans better in video. AnonD-392046, 04 May 2015LG does it again. The G4 is a work of art. 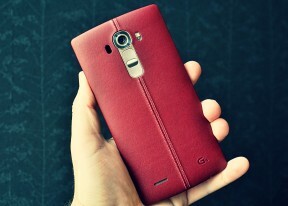 I would say it is the best all round flagship of th... moreIf the S6 is handicapped then the G4 and all others are too. Anonymoose, 07 May 2015>>unless it grows two extra A57 cores in the meantime, we don't see it topping the chart... moreThe Exynos has all 8 cores, runs stronger and faster, and consumes less power. And speaking of games the graphics is actually where the S808 is behind. skin of killed animal on my phone? are you crazy, lg? 2013 called, they want their phone back! The real questions are: how often will anyone need use of the 2 extra CPU cores, vs the extra battery life that will result from not having them. REMEMBER: The performance benchamark trap b******t is a PC legacy. This is not your desktop computer, nor your laptop or even your gaming and movie-watching tablet- it's a goddamn CELLPHONE. I will gladly give up ~10fps in an Android game if it means my phone lasts 24 hours on a charge instead of 12..
i was confused between s6, m and g4. Anonymous, 29 Apr 2015ugly design and too too big... S6 Edge is the one to beat for the times ahead... Let's see if ... moreYep the S6 edge is definately THE one to beat in both performance and design (although I accept beauty is in the eye of the beholder). Nothing wrong with competition though and LG have done a good job here me thinks. Anonymous, 03 May 2015you are wrong i tested the g4 camera last night and i compared to my galaxy s6 edge and believ... moreIs the lg very responsive,and how good is the screen visibility in the sunlight? LG does it again. The G4 is a work of art. I would say it is the best all round flagship of the year. Its not handicapped like the S6 nor is it bland like the M9.